Friedman Fine Art presents marvelous historical and contemporary photographs of Chicago. 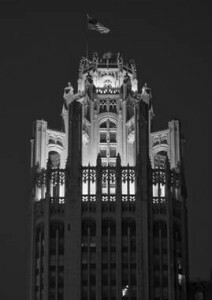 Inspired by the Button Tower of the cathedral at Rouen, France, the Tribune Tower is a Chicago Landmark and part of the Michigan – Wacker Historic District. It is located at 435 North Michigan Avenue. It houses the Chicago Tribune, Tribune Company, and CNN’s Chicago bureau. In 1922, newspaper publisher Colonel Robert R. McCormick held a $50,000 international competition to design, “the most beautiful and eye-catching office building in the world” to be Chicago Tribune’s new headquarters. The winners were New York architects John Mead Howells and Raymond Hood. Their design had elements of a skyscraper in addition to buttresses and spires. Construction started that year and finished 1925. The resulting building was 34 stories, reaching 463 feet. Correspondents for the Chicago Tribune brought back rocks and bricks from historically important sites throughout the world and placed them at the base of the Tribune Tower. Some of the 120 stones are from the Parthenon in Greece, the pyramids in Egypt, the Great Wall of China, and the Taj Mahal in India. A rock returned from the moon was in one of the Tribune windows and a piece of steel from the World Trade Center has been added to a wall. Located at 435 North Michigan Avenue in Chicago, the crown-shaped top is designed after the Tour de beurre of the Rouen Cathedral in France. WGN Radio broadcasts from the building, its studios overlooking Michigan Avenue. To view more great pictures of Chicago Illinois, follow the link.